Amazon Price: CDN$ 50.00 CDN$ 39.62 You save: CDN$ 10.38 (21%). (as of February 13, 2019 1:52 am - Details). Product prices and availability are accurate as of the date/time indicated and are subject to change. Any price and availability information displayed on the Amazon site at the time of purchase will apply to the purchase of this product. This ottoman / side table cover provides elegant protection against the elements. 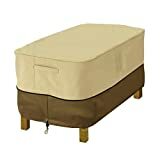 It is made of Gardelle protective fabric system and fits rectangular ottomans and side tables 40-inches long, 30-inches wide, and 18-inches high.